Hawaii Magazine took a poll of its readers to find out what they thought the best restaurants were in the islands. 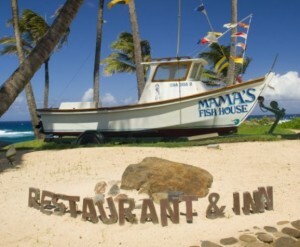 Mama’s Fish House (Paia, Maui)- this has been a top winner year after year. It’s great beachfront location and Hawaiian Fusion cuisine makes it a top choice in Maui. Merriman’s (Waimea-Big Island) The Big Island location is Peter Merriman’s signature restaurant but he also has restaurants on Maui and Kauai, as well. Known for their Hawaiian Regional farm to table cuisine, Merriman’s is always a favorite. Kimo’s Maui- in Lahaina, has been a crowd pleaser for over 40 years. Right on Front Street, you’ll get great sunset views. Make sure to order the Hula Pie and a Mai Tai or 2. Alan Wong’s King Street (Honolulu) is a favorite of our past first family and with good reason. They use locally sourced fish. This celebrity chef’s flagship restaurant comes up on every list of Hawaii’s best restaurants. Haleiwa Joe’s in Haleiwa on Oahu’s North Shore has great sunset views, offers generous portions and is a super popular semi casual dining spot for celebrities and the surfing crowd. My Vacation Lady sends restaurant recommendations to all of our clients heading to Hawaii. In addition to the fine dining restaurants, we’ll help you find some great little places to eat that won’t break the bank so that you can afford to splurge at some of the restaurants listed.